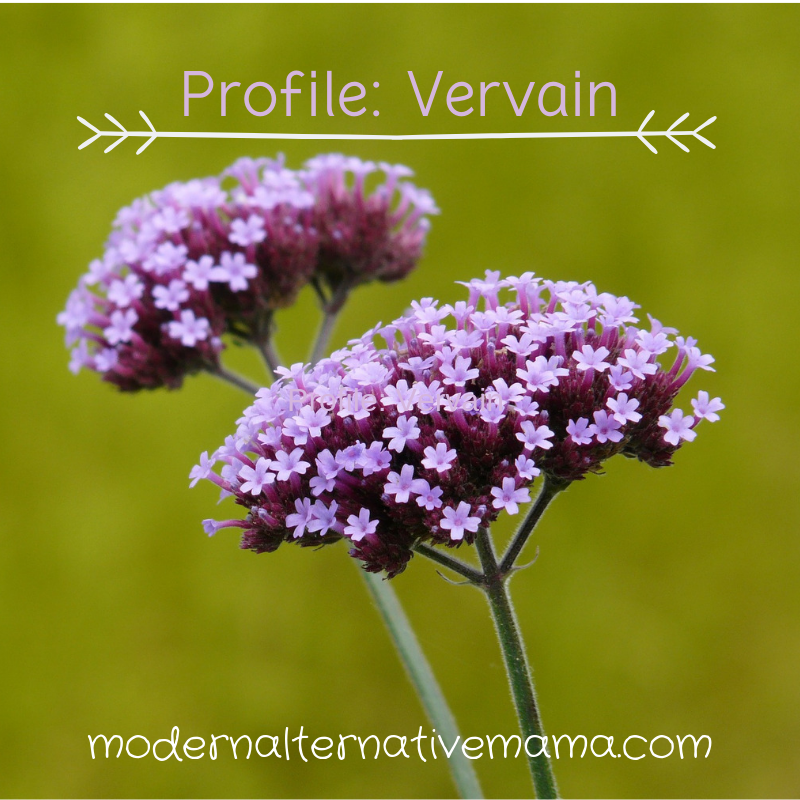 Vervain is a perennial vertical, woody herb with small, light purple flowers and toothed leaves. Its many subtypes are native to North America, Central and Southern Europe, England, Asia, and North Africa. 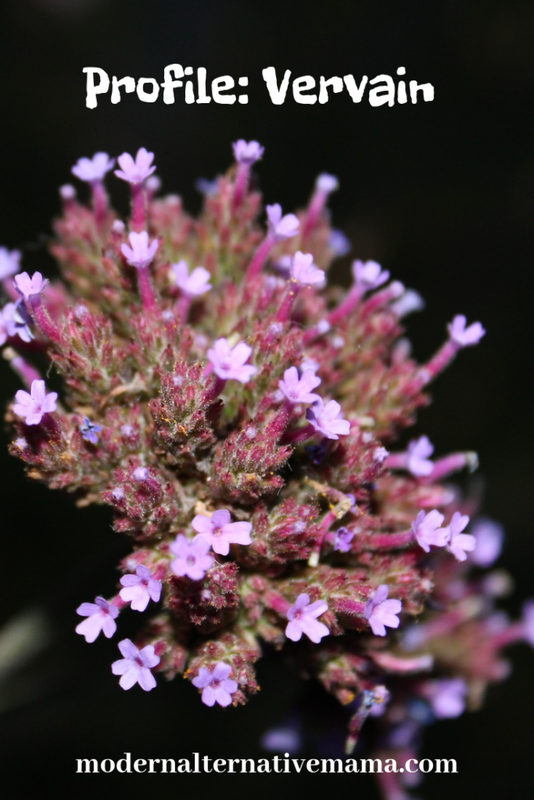 Its latin name is verbena officinalis. Vervain has many names, including verbena, herb of the cross, enchanter’s plant, holy herb, herb of grace, pigeonweed, pigeon’s grass, and Juno’s tears. It has a rich religious and medical history throughout generations. Ancient societies used it in traditional rituals, and its name “herb of the cross” is derived from the belief that it was used as a poultice to stop the flow of blood from Jesus’ side as he was on the cross. Hippocrates is said to have used it to treat the plague. Native Americans used it for headache, insomnia, and circulation; and the Aztecs used the herb as a diuretic and for all issues of urination. Vervain’s aerial parts are used for their medicinal properties. It contains alkaloids, bitters, tannins, and glycodies which lend to its antipyretic, diuretic, and antispasmodic properties. It is also antibacterial and antimicrobial. Reducing fever and inflammation. It can reduce inflammatory markers and even fever and associated pain. Treating urinary issues. It has been found to flush toxins from the urinary tract, dispel water retention, and even prevent damage to the kidneys. Improves digestion. As a bitter herb, it is useful to improve digestion that is caused by stress. A vervain bitter, similar to a tincture, before eating is a great way to improve your digestion. If you have cramps or bloating following eating, vervain tea may help relieve these symptoms, as well. Insomnia. It has been used for millenia to treat insomnia and sleep issues. A cup of tea before bed is a great idea to nip your insomnia in the bud. Limiting anxiety. It increases the release of dopamine and serotonin, helping reduce anxiety naturally. Improves gum health. The Celts made a vervain mouthwash, and today we can find studies that show it can actually help limit gingivitis. A deconction of vervain, which is basically a tea steeped for 6-8 hours, can be used as a daily mouthwash. Liver support. It stimulates the liver for detoxification, and can be taken for acute liver issues as well as ongoing maintenance. Vervain can be found in bulk, teas, in capsules, or in tinctures in health food stores or online. It also may be possible for you to wildcraft in open areas. It also wouldn’t hurt to add it to your herb garden. Vervain prefers to grow in well drained soil, with full sun. Avoid vervain when pregnant as it can stimulate the uterus, however, this herb can be used during labor for the same reason. Consult your physician if you are on any prescription medicines. Vervain is a great herb to keep on hand for liver and kidney health, acute illnesses, digestive issues, and insomnia. For those who have chronic stress, it should be a go to — especially to support digestion and sleep, and to reduce stress. If preparing to conceive, vervain may be a good idea to prime the liver and urinary systems, which undergo a lot during pregnancy, as well as reducing stress — a key factor in conception.